Chelsea Gardens includes private, two-story townhouse units for low-income families in East Vancouver. Chelsea Gardens was also the first housing project built following the Society’s creation. Property was acquired from the City of Vancouver on East 52nd Avenue, two blocks East of Fraser Street. Chelsea Gardens added thirty-two cottages in 1956. After redevelopment, Chelsea Gardens reopened in the spring of 1996 with 55 townhomes for families. This property is just a 10 minutes walk to the bustling Fraser and 49th Avenue shopping district. 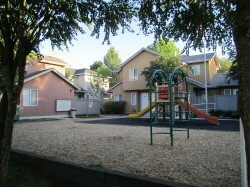 55 family townhouses; private, self-contained 2-storey units. Common room available for meetings or children’s birthday parties. Laundry rooms; plumbing hookups available for townhouse in-suite laundry machines. Chelsea Gardens is a non-smoking housing project.